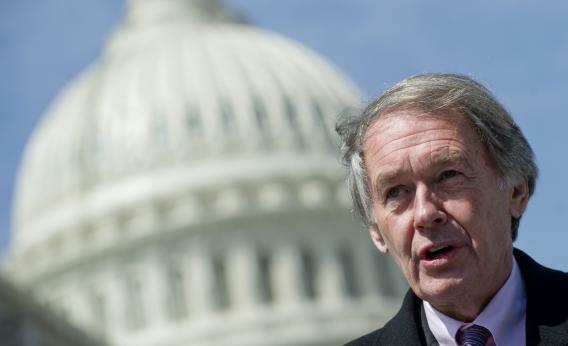 Can Ed Markey Ever Recover From A Gaffe That Democrats Actually Agree With? Massachusetts Democrats and political reporters suffer from a mild trauma. In the winter of 2009-2010, they refused to believe that a bro-tastic Republican state senator named Scott Brown could beat Democratic Attorney General Martha Coakley. The open U.S. Senate seat left by the death of Ted Kennedy was hers for the taking. So they thought. Brown blew past Coakley, humiliated the party, and—until Elizabeth Warren clobbered him by 8 points last November—looked like the future of a revived Massachusetts GOP. So the people who underrated Brown are on the lookout for a Republican surge or a Democratic collapse. I think that’s why this John Stanton story about Rep. Ed Markey, the solid frontrunner for John Kerry’s old seat, has gotten so much play. “I want to go to the United States Senate in order to fight for a constitutional amendment to repeal Citizens United. The whole idea that the Koch brothers, that Karl Rove can say we’re coming to Massachusetts, to any state of the union with undisclosed amounts of money is a pollution, which must be changed,” Markey said to loud applause. “The constitution must be amended. The Dred Scott decision had to be repealed, we have to repeal Citizens United,” he added. Stanton reminds us, helpfully, that Dred Scott codified the idea that the black man had no rights that the white man “need respect.” This is offensive, we’re told, because Citizens United merely built on the precedent that corporations are, legally, people, and trashed many of the limits that used to prevent businesses and wealthy people from plowing money into campaigns. I’ll buy that it’s a dumb analogy, but why is it harmful to Markey? He’s trying to win a Democratic primary. None of his opponents in the primary or general are credibly offended by the comparison, and, as Elspeth Reeve points out, Markey is hardly the first politician to make it. More importantly for him, Democrats really, truly despise Citizens United—or at least they despise what they think it stands for. One year ago, Democracy Corps tested a number of questions (PDF) about corporate/big money and politics and found voters, led by Democrats, easily spun on its badness. Sixty-two percent of all voters said they opposed Citizens United. Sixty-three percent said they wanted to limit money in politics; among Democrats, the number rose to 69 percent. Conservatives don’t blanch when their politicians compare Roe v. Wade to Dred Scott. Liberals show no signs of blanching at Markey. Who is blanching? Why, reporters who are looking for a “Markey in disarray” narrative—he’s out of touch, he’s another Coakley!—and Republicans who’d like Markey to lose the primary. His closest rival is Rep. Steve Lynch, one of the last pro-life Democrats, and one of the few still in the House who voted against the Affordable Care Act. If Lynch wins the primary, he creates a puzzle for Democrats who have no real use for a pro-life vote in a safe blue seat. (It’s the logic that let conservatives beat more moderate Republicans in Utah and Kentucky primaries in 2010. It’s sound logic!) Lynch is a weaker candidate in the special election, and if elected he’d draw a primary challenge in 2014. There may be reasons to doubt Markey’s acumen, but this is a stupid, pack-journalism search for a scandal that simply isn’t there. Update, 5:25 p.m.: Alex Pareene makes the obvious legal point that evaded me. [T]he point Markey was making was not that the Citizens United decision was a travesty of justice on par with Dred Scott, but rather the much more prosaic and less inflammatory argument that because it is now Supreme Court precedent, Citizens United will only be overturned by a constitutional amendment, just as Dred Scott had to be. If we’re giving Markey credit, that’s an astute point! This was a rationale for the 13th Amendment, and would become a rationale for the 16th, after Gilded Age Supreme Courts kept striking down income tax laws. The big Boston Globe write-up on this non-story doesn’t really get to the primacy of the constitutional amendment issue.